The URI men’s hockey team split their weekend series with New York University, snapping their seven-game win streak. The Rams also lost assistant captain Matt Kowash for the season with a broken femur. Kowash’s official injury is a broken femur, sprained PCL and torn quadriceps tendon. He is expected to make a full recovery. URI lost Friday’s game 3-0. NYU scored one goal in the first period and added two more in the second. In the third period, freshman Josh Boulos dropped the gloves with NYU’s Richard Doherty. Each player received a five-minute major penalty and was disqualified from the rest of the game. Kowash broke his femur during the third period of the game Friday night when he collided with an NYU player chasing a puck through the neutral zone. The two players tripped over each other, fell, and collided with the boards. Kowash underwent two surgeries in New York and had traveled home to begin recovery. He scored 18 points in 28 games this season. Since NYU had possession of the puck, a whistle was not immediately blown as the injured player was from URI. Once the play was stopped, junior Filip Akermark had some words for the referee about the call, arguing that the whistle should have been blown since Kowash was visibly injured and in a lot of pain. Akermark argued a little too much and was assessed a 10-minute major penalty. 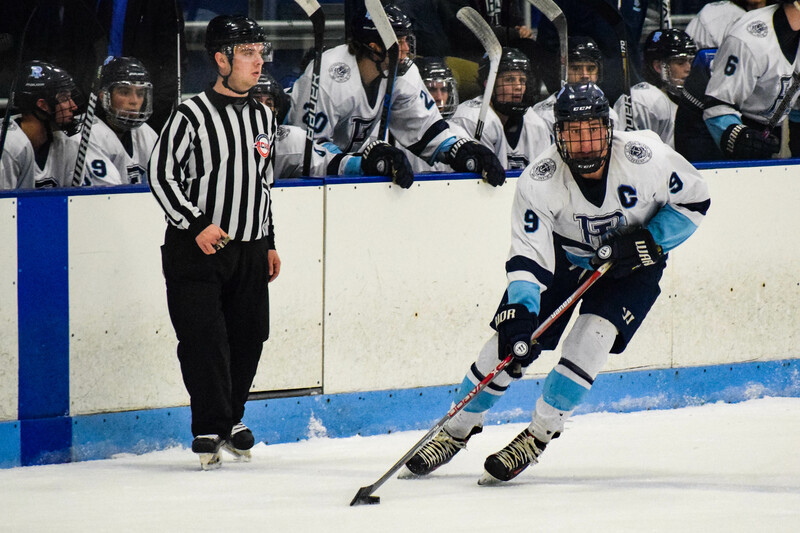 Saturday’s game started off on a high note for URI as junior Luke Vendetto would score for the Rams making the score 1-0 at 9:25 in the first period. Shortly afterwards, freshman Patrick Creamer would score putting URI up 2-0. NYU would bounce back and score a goal at 19:59 of the first period, cutting URI’s lead 2-1. After a scoreless second period, NYU would score to tie the game 2-2 with 10 minutes left. URI would then respond with a goal of their own from junior Evan Rankin, putting the Rams up 3-2 at 15:33. NYU would pull their goaltender with just over a minute left, but a too many men penalty against the Violets sealed the win for URI. URI is scheduled to play Syracuse University this Friday and Saturday but with Syracuse currently suspended and under investigation for an incident after their game at NYU on Jan. 27, the status of this weekend’s games is up in the air. Syracuse had to forfeit both games against Stony Brook last weekend. The URI hockey Twitter account tweeted Wednesday night, “Due to the recent suspension of the Syracuse University hockey program, both games this weekend at the Boss against Syracuse have been cancelled. Both games will be considered 1-0 forfeited wins for the Rams.” The Rams are set to play next weekend against Stony Brook at Boss Ice Arena.